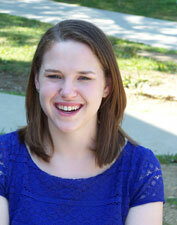 Gail Betz, a graduate of Moravian College in Bethlehem, Pa., interned this summer in the Digital Library. She is currently enrolled in a master’s program in library and information science at Drexel University’s iSchool. Her research interests are technology and instructional practices in an educational environment. Her bachelor’s degree is in history and elementary education. She likes to read historical fiction and is currently reading Wolf Hall by Hilary Mantel. A native of Haverford, Pa., Betz enjoys long distance running. In this summer weather she tries to get out before sunrise to run. She has participated in half-marathons and one full marathon. Concerning the scope of the Digital Library internship, Michael Foight, Special Collections and Digital Library coordinator, says, “After a period of intensive training and practical experience consisting of a set of modules including management of digital libraries, selection for digitization, social media, online exhibits, copyright, metadata, cataloging, rare materials handling and scanner training, each intern selects, in conjunction with the needs and priorities of the digital library enterprise, a project that highlights one of these content area modules and produces a representative work project” about four weeks into his or her internship. Gerald Dierkes also contributed to this article.